Perhaps you’ve been there, filled with so much hurt, the walls so tall between you and your spouse, you’ve given up trying. Because trying hurts, and you’ve run out of hope. They say marriage takes work. That’s true on a good day. But when life, fights, and destructive actions have chipped away at your love, it takes a down right marathon. But it can be done, and it will be worth it. So worth it. Because there’s nothing quite as beautiful as forever, committed love. Someone’s got to do it; why not you? When things are tough and tension is high, someone has to step up, humble themselves, and do whatever it takes to save the ship. Otherwise everyone’s going down, and it won’t be pretty. When chaos, or silence, reigns, we have two choices: focus on our spouse’s faults–what they’ve said or haven’t said, done or haven’t done, and what we think we “deserve”, which will only keep us miserable and in isolation. Or we can put our marriage first, muster up our inner strength, and do what we need to do. For as long as we need to do it. The alternative? Live in defensiveness and self-justification, convinced your loneliness is all your spouse’s fault, and slip further and further into isolation and misery. You may very well be “right”, and completely justified in your anger. In fact, you could be right and justified all the way to divorce court. Early in our marriage, my husband and I went through a very rough spell; like sitting in a divorce lawyer’s office rough spell. I knew deep in my heart divorce wasn’t an option, and there was no way I could rob our daughter of her daddy, so I–we–chose to stick it out. At first it was hard. Awkward. Tense. Honestly, I didn’t feel a whole lot of love for my husband, so I began to pray. That God would soften my heart toward him and help me see the good in him. That God would help me see my husband’s heart. God honored that prayer, allowing me to see my husband on a much deeper level. What I realized–he was hurting just like me. That prayer changed everything. It’s been over a decade, and I’m still praying for both of our hearts, that God would soften our hearts toward one another and draw us closer. I don’t care how mad you are, how hurt you are, and how badly you want to curl up in bed with your box of tissues. In fact, that’s when you and your spouse need to get out and play most. To remember why you fell in love. So you can begin to see the good in your spouse again–like the cute way he laughs when being goofy, or the way her eyes light up when she’s amused, or maybe the way his gaze intensifies moments before he closes in for a kiss. You remember that, right? The day his face brightened when you walked in the room? Or the way her breath would catch when you’d grab her from behind and wrap your arms around her? You can have that again, if you really want it. * It won’t be easy, but twenty years from now, after you’ve done the hard work and have surrendered your heart and marriage to Christ, and you and your beloved are sitting on that porch swing, wrinkled and gray and more in love than you’ve ever been, it will be worth it. Whether your marriage is struggling or vibrant, pause right now and pray for strength. Pray for the strength to be the spouse your beloved needs, to move past old hurts and begin each day anew, to see the best in your spouse even when arguments occur, life gets crazy, and you’re both stressed out. Then listen to this song, a song my husband–a man I almost lost some 14 years ago–sang to me, one night on a very special date, a date we enjoyed because we did the hard work and chose to stay. *Please note, I am not referring to marriages shattered by addiction or abuse as I’m unqualified to understand or discuss those types of marital problems. Where are you in this true-love journey? Where do you want to be? What can you do today to more toward that goal? Share your thoughts with us in the comments below, because we can all learn from each other. After every storm, Dawn Breaks. As the hurricane forces Jacqueline to evacuate, her need for purpose and restitution propel her north to her estranged daughter. The same path leads her into the arms of a handsome new friend. However, because Jonathan Dunn is dealing with issues of his own–including a potential conspiracy at his new job that could implicate him–Jacqueline isn’t sure he will be the one she can lean on during the difficult days ahead. And then there are the three orphans to consider. 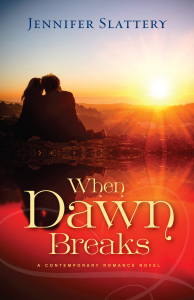 Must she relinquish her chance at having love again in order to find purpose and restitution? 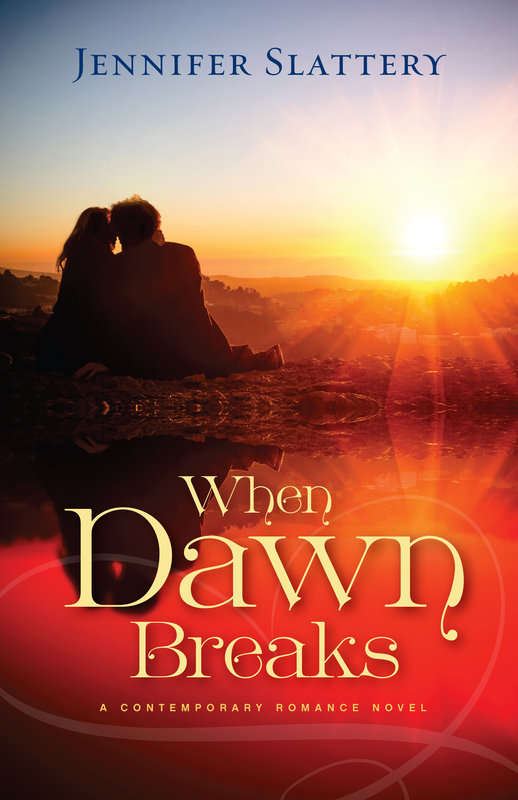 Hilarious and heart-wrenching, When Dawn Breaks is a contemporary romance filled with humor and intrigue along with characters who overcome life’s obstacles and embrace hope. Find more books by Jennifer Slattery here. Very good post, Jennifer. Thank you. Thank you for this article! Thank you! Thanks, Susan! And thanks for “sharing” it on FB. I hope and pray it provides the strength, inspiration, and encouragement those in a tough relationship need to keep trying, and keep praying.